Tim Schulte comes to Bauhaus from Germany, where he worked for over a decade in top restaurants. 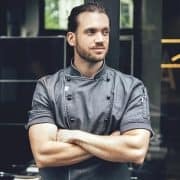 In 2013, he was awarded the distinction of ‘Best Chef of the Year,’ and after winning the award went on to work alongside the celebrity chef and restaurant owner Tim Mälzer in Hamburg. Tim worked in Vancouver for a brief time with a stint at Bauhaus before crossing the Pacific to work under Chef Neale White as Sous Chef in Melbourne and helped to open 12 Micron in Sydney with New Zealand chef Andrew McCrea.